Getting guests in through the door once is an impressive feat. With so many options in the hospitality industry today, it is difficult to gain the attention, and patronage of potential customers. There are often multiple hotels within one-mile radius of one another, and this makes the competition very steep. So, if you are managing to attract guests to choose your hotel over the competition, it is a job well done. But is it enough? The real challenge lies in getting guests to return time again. Building that loyalty means that your property left quite an impression on the guests and they are willing to return. Retaining guests is the best way to build a reliable customer base that will help cement a property’s business. Hoteliers, of course, cannot expect guests to become repeat customers on their own; they need a little bit of cajoling. To get customers hooked on to your property, you need to show that you are genuinely interested in their feedback and in creating the best possible experience for them. Hoteliers need to be attentive to guests during their stay, but the work doesn’t end there. It is important to keep in contact with guests even after they’ve checked out. Acknowledge your Customers: Give your guests a hand-written thank you note when they are leaving. This simple gesture is the best way to show your gratitude. You can also express your gratitude by sending a thank-you note on email once they have checked out. This will give you a chance to ask for feedback as well. Make it a Long-Term Relationship: Get your customers hooked on to the loyalty program (Read: Benefits for hotels offering loyalty program) and entice them to sign up. Inform them about the benefits of signing up like discounted stay, and privileged access to facilities. This will ensure that the next trip they plan, they will consider your property or one of your many properties. Remember their Special Occasions: Send emails or messages to your guests on their anniversaries or birthdays. If the guests stay in the same country, you can also arrange for a bouquet of flowers to be sent. There are high chances that they will mention this special gesture to their friends and family, spreading your hotel’s name by word-of-mouth. Utilize Social Media: Build a relationship with your customer on social media channels. Offer certain benefits to customers liking your Facebook page and following you on Twitter. Always reply to the feedbacks and posts of your customers and encourage them to post reviews. Building a good clientele is the primary focus of every hotelier but maintaining a balance with the customer is a bigger challenge. Once you have built a relationship, there is no way you’re going to lose your customers. A happy guest will be your best friend for years. Today, hoteliers need to plan about many things to manage and market their hotel well – from investing in the right hotel management software to having a social media presence to engage guests better. 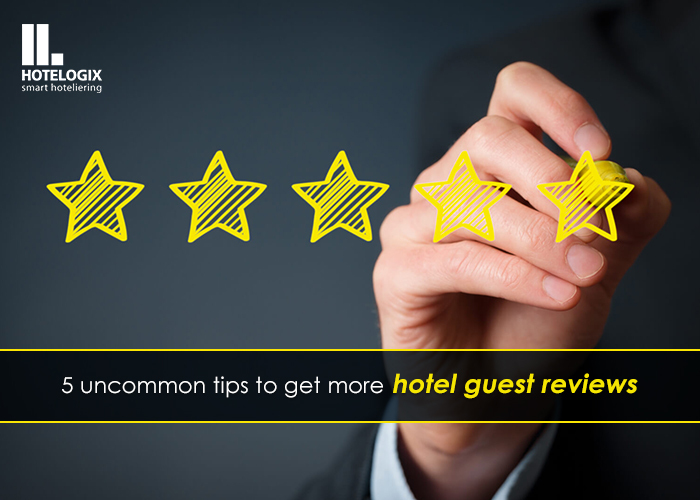 A little bit of extra effort in retaining guests can definitely go a long way. "Will your Guests Visit your Hotel Again? ", 5 out of 5 based on 1 ratings.